With a Tillers Commendation in-hand, fully expanding Sunsong Ranch takes about a week. Thus, at the end of last week, my Hunter’s farm was complete. I’d run a few dungeons with my Druid already, bringing her up to level 89, and she was raring to finish leveling. On Friday night, therefore, I parked Kerisa at the Darkmoon Faire carousel and chain-queued for dungeons. After a few, I was definitely starting to feel like I’m getting the basics of Druid healing — setting up a PowerAura to show the time remaining on Harmony in big pink numbers helped a lot — though I’m sure there are lots of subtleties that, having only healed Normal 5s, I haven’t learned. A few hours later — just in time for Cymre’s Ulduar run — Kerisa dinged 90. Now I have the same number of level 90s as I had level 85s at the end of Cataclysm, about a year ago. That milestone accomplished, the Paladin and the Priest and the Blood Elf Mage are all jonesing to be next. I’m leaning toward pushing the Priest. She’s the furthest behind, level-wise, but I don’t have a clothie in Pandaria yet and I am reluctant to shell out for big bags on the AH despite being in rather desperate need of more inventory space. Nevertheless, this weekend it was the Blood Elf Mage who won. …then made her set her hearth to the Legerdemain Lounge so that she would be less tempted to go back to Outland. 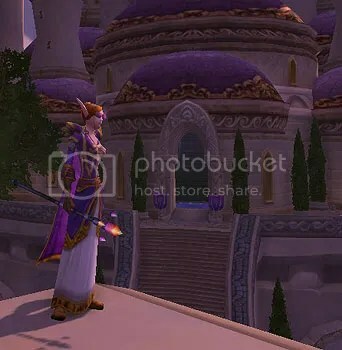 Having done that, it occurred to me that part of my reluctance to take Kaelinda to Northrend has been that I don’t particularly want to quest with her in Northrend. There aren’t very many quest rewards that she wants, and there isn’t much that I particularly want her to do for story/RP purposes, either. On Saturday evening I loaded her up with all the heirlooms I have available on her server and ran a couple of dungeons. I plan to LFD with her until she reaches level 77 and can head up to the Argent Tournament, and then she can idle there while I work on the Priest and the Paladin. This weekend has been pretty exciting. I went to put something in Void Storage, not having looked in my Void Storage since I transferred most of my characters from Lightninghoof to Bloodhoof nearly a month ago, and was horrified to find that it was empty! Completely empty, on all the characters who had it! 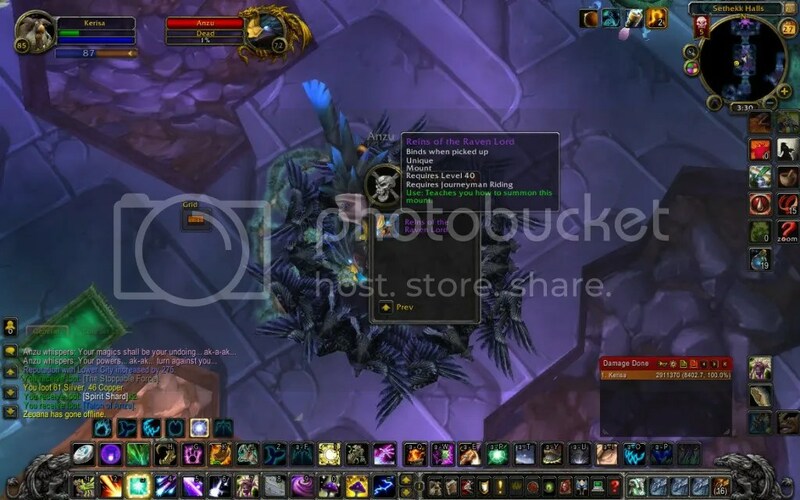 I put in a ticket, and after a false start when I got a boilerplate response about loot being misassigned during a raid, GM Jeydolen chatted with me. Jeydolen assured me that all the stuff was still there, and suggested that a UI error might be why I couldn’t see it. After performing the UI reset that Jeydolen suggested, I still couldn’t see my stuff. The Void Storage dude was giving me the tutorial box, without asking for money to (re)open Void Storage, so I clicked through it and voila, my stuff appeared! Then I felt a little silly — perhaps I had just needed to click through the tutorial boxes again to begin with, and I didn’t really need to have done the UI reset. I was still very appreciative of Jeydolen’s prompt, gracious, and helpful response to my second ticket. Thank you, GM Jeydolen! Then I went to this weekend’s Laid Back Raid with Kerisa. Karazhan and Gruul’s Lair were on the ticket, and I hoped to get the T4 shoulder token. 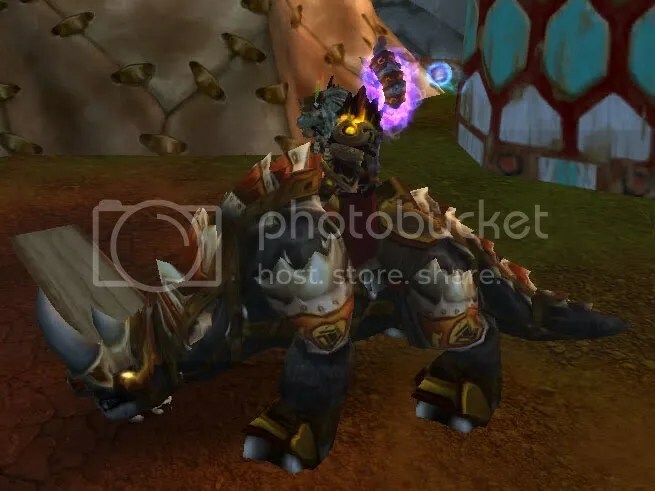 I didn’t, but after Kara and Gruul, part of the group continued on to Magtheridon and from thence, at my suggestion, to Tempest Keep, where Kerisa scored the T5 shoulder token. Many thanks to the estimable Coolidge for heading up that part of the evening! Finally, ever since I started writing this blog, I’ve intended to eventually do a series on “Stuff my Characters Wear”. Over the last few days, I’ve begun working on it. I’ve been going through all the alts for whom I have long-term goals and attempting to put together for each one of them a coherent, attractive ensemble that I’d be happy to see her wearing for a long time. It’s a lot easier for the higher level characters! On my lower-level characters, the outfits I’ve been making are frequently only partially Transmogrified, but the idea is to make something that would also be an attractive full Transmogrification Template Kit for a high-level character. Some of my characters will need to gain a level or few of XP before I can get them into an outfit that I like. For the time being, I am focusing only on Transmogrification-friendly outfits. After the initial set of posts is done — but not immediately — I also plan to expand the series to include “wrong” or mixed gear-type pure RP outfits. Who is your main character’s love interest? Are they involved with someone, do they pine for someone? Many bloggers lately have been discussing playing with IRL couples who raid together. How would this transfer to the characters they play? Why would their characters slay dragons together? BTH and I have leveled our mains together and raided together. At the moment, we’re not raiding together, but I anticipate that we will level to 90 together in Mists. Because Ronada and Kamalia are both female toons, however, I have always described them as being favorite cousins — although I respect the people I know who are LGBT, it is not something my own characters will ever be. 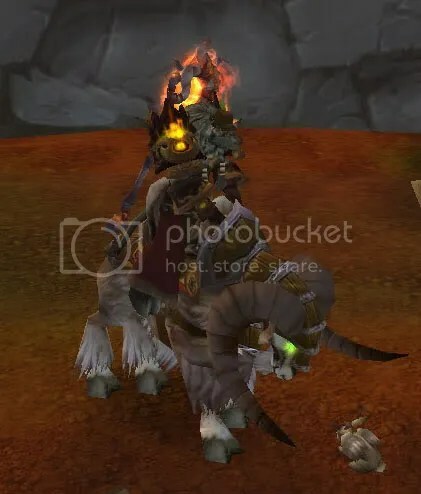 Kamalia did have a secret crush on Karthip, the male Tauren Warrior who was the main tank of the guild with whom she ran Kara, Naxx2.0, and Ulduar, but by and large I’ve tended to think of her as being single, and not too fussed about it. Interacting with the orphans during Children’s Week does make her hear the ticking of her biological clock more loudly for awhile, though. Kerisa leveled to 80 with BTH’s Warrior, Watha, who happened to be BTH’s only male Tauren character. I imagined them as being a betrothed couple, but I never brought up the idea with BTH because I thought he’d laugh at it. By the time we reached 80, BTH had decided that he wasn’t really excited about playing a Warrior. He stopped playing the character not long after we reached 80, while Kerisa continued on to gear up for and raid Trial and ICC. Kerisa eventually leveled up to 85, but Watha is still level 80. I still imagine them as a couple, and they are probably married by now, though I’m not sure when exactly it would have happened. Kymberlea is married with four children, and the tension between her RP story and the adventuring, questing lifestyle means that she’ll probably be lucky to make it as far as level 40. Kenosha is married, and Keshona is her grown daughter. Kimorene, Kandrista, and Keriluna are all widows. Kimorene‘s husband died in the Plague and she now lives with her son and his family in Stormwind, Kandrista‘s was killed fighting Arthas’s forces during the Battle of Silvermoon, and Keriluna‘s was one of the Druids slumbering in the Dor’Danil Barrow Den. 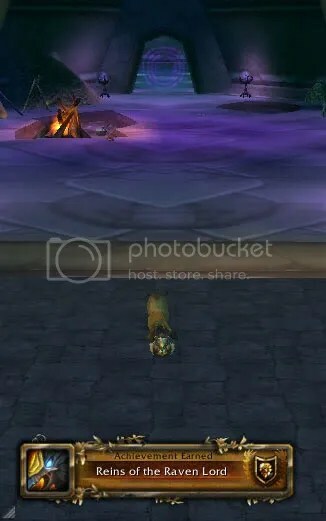 Kelilla has hinted to me that she had a love interest whom she believes to have perished during the initial irradiation of Gnomeregan, but I’m uncertain how close the relationship actually was. Kazuliza once had an unrequited crush on Ace, and since her sham affair with Chip, she has been a little bitter and sworn off getting involved in new relationships for awhile. Until they tell me otherwise, I assume that all of my other characters are single and happily so. 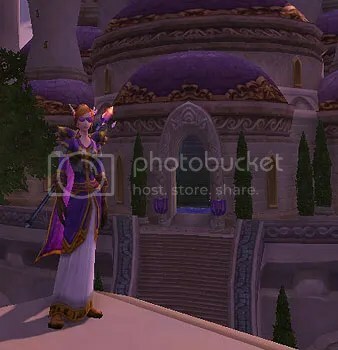 After Khrissalys went to all the effort of obtaining four pieces of Brewfest gear — the purple hat, the slippers, the dress, and the lederhosen — it seemed only appropriate to buy a portal to Dalaran and dance in the Silver Enclave beer garden. I saw a handful of characters running about, but the city seemed very quiet and deserted. I wonder what those other players thought of the little level 20 Dwarven Mage running around gawking at everything. 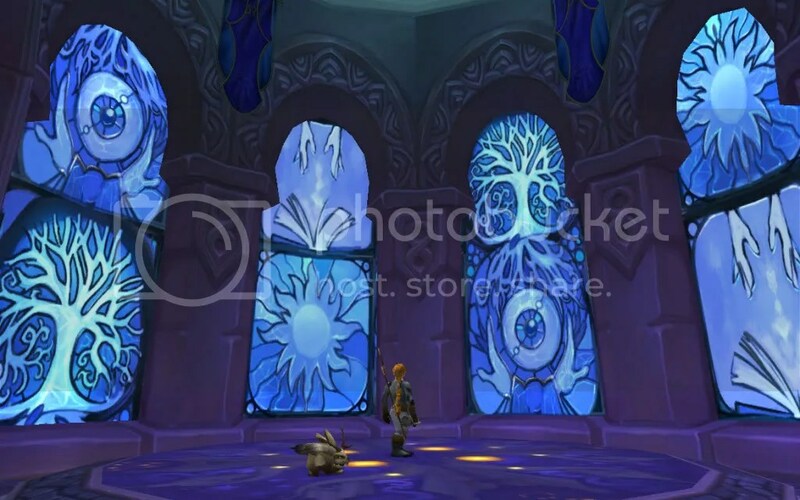 And gawk I did, because I’d never had the opportunity to explore the Alliance zone of the city before. 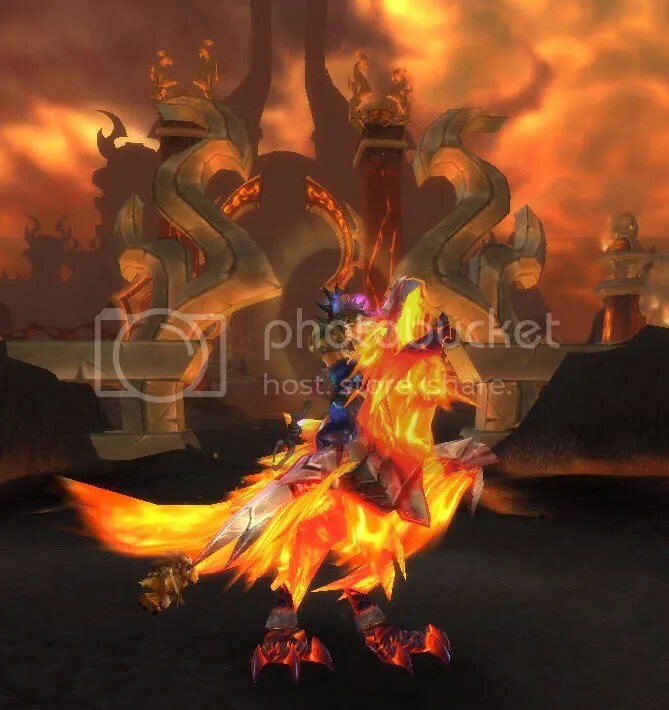 …and then when I queued up for a Coren Direbrew run with Kerisa just for kicks and giggles while on my way out to the Shrine of Malorne to do my Firelands dailies yesterday, she got it instead. 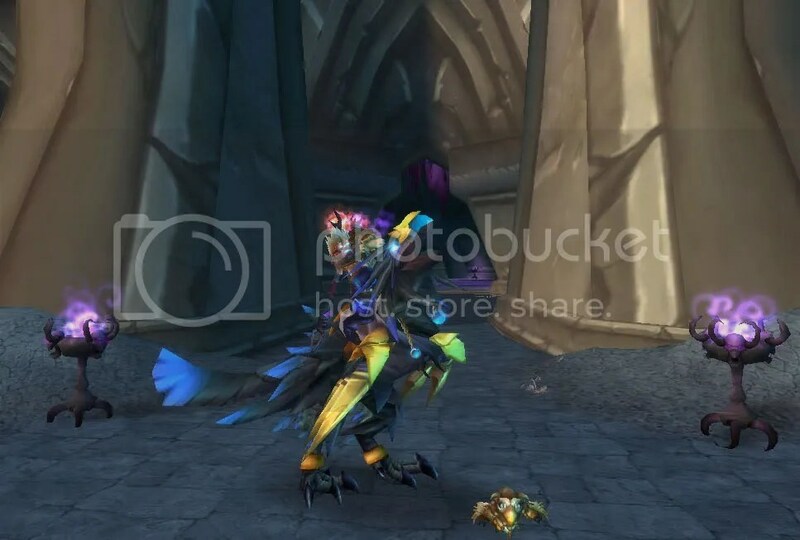 Kerisa seems to be having all the luck with mount drops these days! BTH’s project in Canada has come to an end, so I get to drive 2k miles back to our old place in the Midwest this weekend. Then we’ll have to get internet service at that apartment again — so it might be awhile before I’m back online. 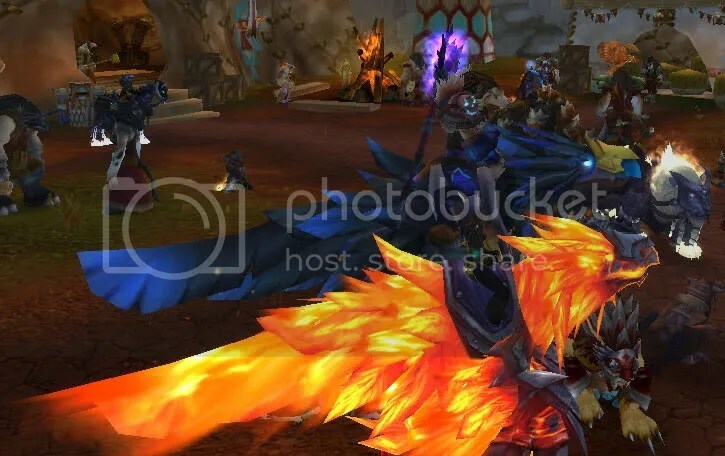 Last week, pre-nerfs, our Thursday night 10man alt run went into the Firelands and managed down three bosses — Shannox, Beth’tilac, and Rhyolith. This was much more than we’d ever accomplished previously; most weeks, we’d been lucky just to get Shannox down before our time ran out. This week, post-nerfs, we easily downed those three, then proceeded to one-shot Baleroc and Alysrazor. Next week maybe we’ll even be able to take a whack at Majordomo! Although the nerfs have felt kind of sad relative to our 25man main group progression, they’ve been a great thing for our 10man alt run progression.